IMPORTANCE Pigmented lesions in decorative tattoos cause diagnostic difficulties at a clinical and dermoscopic level. In cases of laser removal of tattoos, hidden suspicious nevi may be revealed gradually. OBSERVATIONS We describe the first case of a malignant melanoma that developed on a preexisting nevus within a tattoo during and between the phases of laser removal. The patient refused to undergo excision of the nevus until we made excision conditional for continued laser treatment. The number of decorative tattoos has been increasing, as has the demand for their removal by laser devices. Traumatic events, such as UV and ionizing radiation, mechanical trauma, persistent inflammatory reactions, and burning, have been discussed as cofactors for neoplasm.1,2 Only 16 cases in the English literature document malignant melanoma developing in tattoos.3−5 We herein describe a malignant melanoma that developed on a nevus within a tattoo that had undergone removal by laser. Report of a Case A white man aged 29 years presented to our clinic for the first time in 2001 to have his decorative tattoos removed by laser. 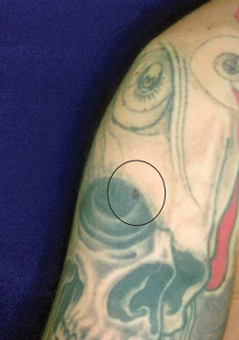 The large multicolored tattoos on both arms and his chest had been applied approximately 10 years earlier (Figure 1). After detailed informed consent, we started tattoo removal in March of 2002 using a Q-switched Nd:YAG laser (Affinity QS; Cynosure) set to a wavelength of 1064 nm to treat black ink and 532 nm to treat red and orange dye. We started with 1.0 J/cm2 , and in the course of the treatment we increased energy up to 7.1 J/cm2 for the 1064−nm wavelength (spot size, 4 mm) and 1.5 J/cm2 for the 532−nm wavelength (spot size, 6 mm). Owing to the extreme size of the tattoo, only partial treatment could be applied during each session. Because of a loss of response after 43 sessions, we started using a Q-switched alexandrite laser (Accolade; Cynosure). The energy was increased from 4.0 to 4.8 J/cm2 with a spot size of 4 mm. Before laser treatment, we assessed the patient’s skin and noticed a nevus on his right shoulder. Because the nevus was situated within the laser area, we strongly advised him to have it excised. Possible changes within the nevus were barely detectable because of the intracutaneous black tattoo pigments in the area. Initial dermoscopy findings showed no atypical signs. The patient strictly refused exc ision. We repeated our explic it request for him to have this nevus removed several times, and he rejected each request. In November of 2009, after a total of 47 laser sessions, we informed the patient that we would not continue laser treatment because of forensic reasons, and he agreed to have the nevus excised (Figure 2). At that time, dermoscopy findings showed characteristics of an early melanoma. The excisional biopsy results showed the lesion to be a Clark level II superficial spreading malignant melanoma with a Breslow thickness of 0.45 mm (Figure 3). Chest radiography and lymph node ultrasonography yielded no abnormalities. The patient refused a second excision with a free margin. Pigmented lesions should not be treated by laser because of forensic considerations and to prevent potential laserinduced changes. In 2004, Kerl et al9 published a tale of caution concerning laser therapy and melanocytic nevi and emphasized that, for most melanocytic lesions, laser therapy is not appropriate.9 No scientific evidence suggests that laser treatment converts benign nevi into melanoma, and we will never know if the nevus in our case would have progressed the same way with or without laser treatment. In the course of Q-switched laser treatment, pigmented cells can lose pigmentation, thus making assessment of melanocytic lesions more difficult. Kopera et al10 already described the pitfalls of treating melanocytic lesions by laser: S-100–positive cells persisted ex vivo throughout a single course of Q-switched ruby laser exposure. In 2000, Kaskel et al11evaluated the relationship between traumatic events (eg, applying or removing a tattoo) and melanoma characteristics by means of a retrospective questionnaire addressed to 369 patients with melanoma. The authors found no evidence that traumatic events are a causative factor for melanoma formation.11 Tattoo removal with laser therapy also releases potentially toxic substances, such as dibutyl phthalate in black ink, with unknown long-term consequences.5,12 Gottschaller et al13 presume that the main danger of treating a pigmented lesion by laser is a clinical misdiagnosis, whether the lesion was a primary malignant melanoma or whether a malignant melanoma was induced by the laser treatment. In 2010, Zipser et al14discussed the outcomes of 12 patients presentingwithmelanoma subsequent to previous treatment with laser. ARTICLE INFORMATION Accepted for Publication: April 4, 2013. Published Online: July 31, 2013. doi:10.1001/jamadermatol.2013.4901. Author Contributions: All authors had full access to all the data in the study and take responsibility for the integrity of the data and the accuracy of the data analysis. Study concept and design: All authors. Acquisition of data: Pohl. Analysis and interpretation of data: Raulin. Drafting of the manuscript: Pohl. Critical revision of the manuscript for important intellectual content: All authors. Statistical analysis: Raulin. Administrative, technical, or material support: All authors. Study supervision: Raulin. Conflict of Interest Disclosures: None reported. Additional Contributions: Markus Hantschke, MD, Dermatopathologie Friedrichshafen, Germany, provided the image used in Figure 3. Khan IU, Moiemen NS, Firth J, Frame JD. Malignant melanoma disguised by a tattoo [case report]. Br J Plast Surg. 1999;52(7):598. Kluger N, Phan A, Debarbieux S, Balme B, Thomas L. Skin cancers arising in tattoos: coincidental or not? Dermatology. 2008;217(3):219−221. Paradisi A, Capizzi R, De Simone C, Fossati B, Proietti I, Amerio PL. Malignant melanoma in a tattoo: case report and review of the literature. Melanoma Res. 2006;16(4):375−376. Varga E, Korom I, Varga J, Kohán J, Kemény L, Oláh J. Melanoma and melanocytic nevi in decorative tattoos: three case reports.J Cutan Pathol. 2011;38(12):994−998. Kluger N, Koljonen V. Tattoos, inks, and cancer. Lancet Oncol. 2012;13(4):e161−e168. Gall N, Bröcker EB, Becker JC. Particularities in managing melanoma patients with tattoos: case report and review of the literature.J Dtsch Dermatol Ges. 2007;5(12):1120−1121. Singh RS, Hafeez Diwan A, Prieto VG. Potential diagnostic pitfalls in melanoma arising in a cutaneous tattoo. Histopathology. 2007;51(2):283−285. Karsai S, Krieger G, Raulin C. Tattoo removal by non-professionals: medical and forensic considerations.J Eur Acad Dermatol Venereol. 2010;24(7):756−762. Kerl H, Raulin C, Landthaler M. Controversy in dermatology: laser therapy and melanocytic nevi [in German].J Dtsch Dermatol Ges. 2004;2(8): 681−683. Kopera D, Hohenleutner U, Stolz W, Landthaler M. Ex vivo quality-switched ruby laser irradiation of cutaneous melanocytic lesions: persistence of S-100–, HMB-45– and Masson-positive cells. Dermatology. 1997;194(4):344−350. Kaskel P, Kind P, Sander S, Peter RU, Krähn G. Trauma and melanoma formation: a true association? Br J Dermatol. 2000;143(4):749−753. 12. Lehner K, Santarelli F, Vasold R, König B, Landthaler M, Bäumler W. Black tattoo inks are a source of problematic substances such as dibutyl phthalate. Contact Dermatitis. 2011;65(4):231−238. Gottschaller C, Hohenleutner U, Landthaler M. Metastasis of a malignant melanoma 2 years after carbon dioxide laser treatment of a pigmented lesion: case report and review of the literature. Acta Derm Venereol. 2006;86(1):44−47. Zipser MC, Mangana J, Oberholzer PA, French LE, Dummer R. Melanoma after laser therapy of pigmented lesions: circumstances and outcome. Eur J Dermatol. 2010;20(3):334−338. 15. Lee EH, Busam KJ. Desmoplastic melanoma presenting after laser treatment: a case report and tale of caution. Dermatol Surg. 2011;37(11):1689−1692.